The shaman's journey is a timeless and universal technique that gives us access to the deepest levels of our being. Most of us now have a pretty good understanding of consciously setting clear goals and thinking positively in order to produce the results we want in our lives. We understand how the mind affects the body, or how our thoughts create our reality. Positive thinking, getting in the right mindset, visualizing outcomes, and changing beliefs engage the level of the mind. Making good choices and doing work engages the level of the physical. But few understand the value and necessity of engaging on the subconscious levels in order to obtain extraordinary results in extraordinary ways. The shamanic journeys that follow are designed specifically to engage our deepest subconscious levels as well as the level of the mind and body. The deepest of these levels is what we refer to in English as the Soul, in Sanskrit as the Aura, in Italian as the Anima and everyone has a name for it in their own language. Quantum physicists call it dark energy or dark matter because they cannot see it or measure it, but they know it must exist. This Soul level is your essential self, your blueprint or template that influences all of your life experiences. It is who you are even after this physical body is gone, and it is the you that can't wait to come back to the theater for another hundred years and hopefully with a better script. This level of our being informs our subconscious level that we call the Mythic. The Mythic level of our being holds broad and often archetypical beliefs such as "no pain, no gain", or "life is a struggle or a school", or "we've been cast out of the Garden of Eden", and "It was woman's fault for tasting the fruit of knowledge and power." These deep and often inherited Myths can even contradict what we learn on the level of the mind, and you can see how they can create all kinds of trouble in our life experience since they too create our reality. For example, if a woman wants to feel powerful and worthy of unconditional love and abundance and have those experiences, she will want to make sure that her mythic layer does not hold the story I just mentioned. Instead, how about replacing the old mythic story with one that says that woman, or the Feminine, gives birth to all Creation, including the masculine, and therefore has dominion over all. Many lifetimes of non-serving mythologies can and have created wounds in the Soul, Mind, and Body that just get perpetuated time after time. The Shamanic journeys put and end to those cycles and not only are the wounds healed, and the stories changed, but we are freed and empowered to leap into the greatest story we can imagine, our ideal Destiny, in our complete wholeness. The album is designed for you to listen to the tracks in the order that they are presented, but there is no harm in coming back to any of the individual tracks in any order, as you feel compelled to do so. Enjoy. See Jon's other CD "Practical Meditations for the Modern Lifestyle" as well. The combination of the Shamanic Journey and Practical Mediations CDs can completely transform you life experiences around health, relationships, work, and resources. 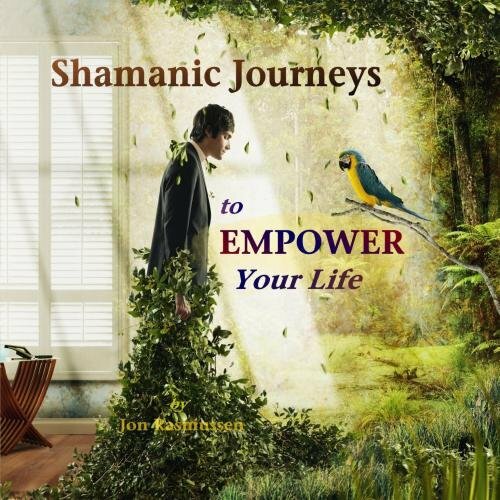 Jon Rasmussen is a world-renowned shaman, advisor, and author of the book Dreaming Your World Into Being. He brings the gifts of ancient shamanism to the modern world. For more information visit his website at www.dreamingintobeing.com. Thanks to The Four Winds Society for much of what is contained in these journeys. If you have any questions about this product by CD Baby (distributor), contact us by completing and submitting the form below. If you are looking for a specif part number, please include it with your message.